Giftah is a simple way for people to trade in their unwanted and unused gift cards. A great amount of people in North America that receive gift cards worth in the hundreds of dollars but have no plan in buying anything at the particular stores. 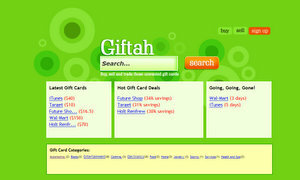 Giftah was built to solve that problem; allowing people to trade their unwanted gift cards with each other. The person selling the gift card will receive a monetary compensation, while the buyer in return will buy the gift card at a discount. Giftah was created by three students, Rez, Nick and Henry, from the University of Waterloo in Canada, and the service is only available for anyone in Canada and the U.S.